All in with King_Ten on a King_high flop, Bud Baker was well behind the Ace_King of then-bigstack Harlan Karnofsky. A Ten on the river drew quite the exclamation from Karnofsky and a large chunk of his chips went away. 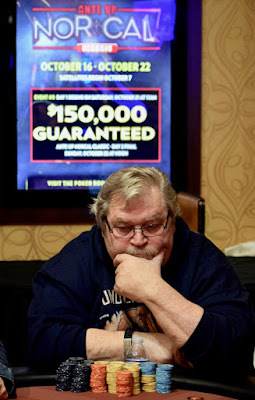 The last of Karnofsky's chips just went to Baker as well, and he's now at 320,000, about 90k clear of teh field with seven tables left in the Main Event.